Eric Carle has to be one of the most beloved authors/illustrators of all time. He was always a featured favorite in every school that I worked in by classroom teachers and art teachers alike. There are also a slew of ideas floating around cyber world that piggyback off dhis work. Today we will look at some of my favorite, a great clip about his work and a few great finds of extension activities. Carle has illustrated over 70 books, many of which he has also written. He uses hand painted paper from which he cuts and assembles collages to create his easily recognized illustrating style. My top three favorite Carle books are Draw Me a Star, The Very Hungry Caterpillar and Pancakes, Pancakes! Here is a video clip from Eric Carle about his newest book, The Artist Who Painted a Blue Horse. He talks about the importance of nurturing children’s curiosity and ideas. In 2002, the Carle family opened the Eric Carle Museum of Picture Book Art in Massachusetts. One day when I can get to the east coast, I will definitely be making a visit. There are oodles of ideas for extension activities related to Carle’s work. Let’s take a look at a few of my favorite literacy activities. I created this caterpillar from a green sock and painted some red eyes on it. 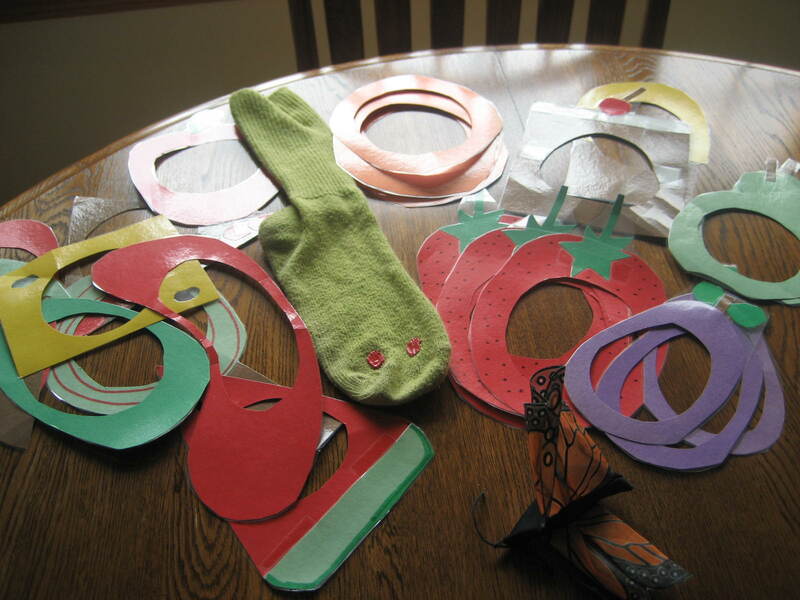 I then cut out all of the foods from the story out of construction paper and laminated the pieces. Finally, I bought a small butterfly finger puppet and presto I had the beginnings of a puppet show retelling. The Imagination Tree created tissue paper letter collages and then framed the letters. What a cute idea! The Scholastic website has a very helpful author study on Eric Carle including an interview with him. Time for Play walks you through creating a DIY felt board. Felt boards are inexpensive and great for a variety of literacy uses including retellings of stories. Kidzclub has some great story pattern printables for Today is Monday, From Head to Toe, and Papa, Please Get the Moon For Me. 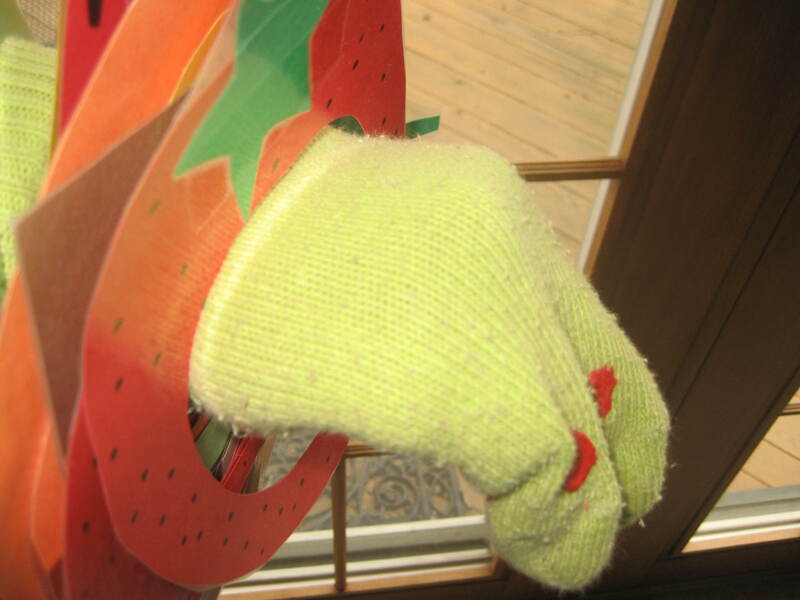 Interested in more ideas of all things Eric Carle? Head over to my Eric Carle Pinterest board. *Please check out my linky parties page to see where I’ve linked up to this week. Really enjoyed the interview with Eric Carle. He really is a beloved author and my daughter adored his books, and my grandchildren love his books. Again creative activities for he kids — you are so good with activities.